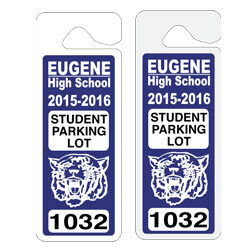 Hang tag parking permits are excellent if you need to move tags from one vehicle or another. 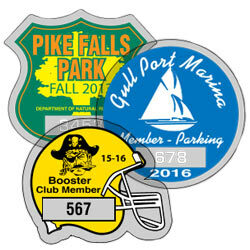 The problem with stickers is that they stay with the vehicle which can make it problematic when you have to re-issue a permit. 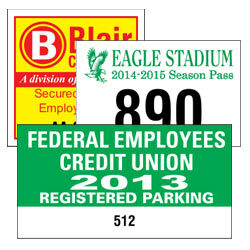 With hang tags, there's no hassle of having to remove and replace an old sticker just hang it else where. 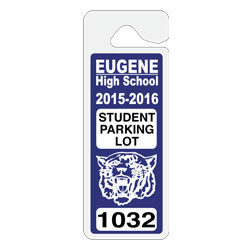 Also if something happens to a permitted vehicle simply remove the hang tag and place it in a new one. 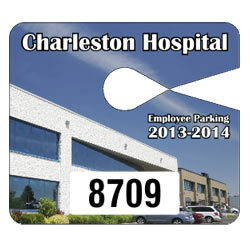 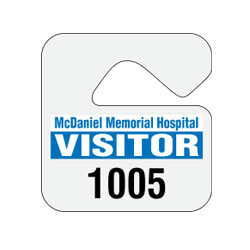 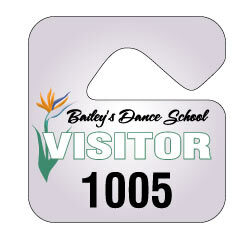 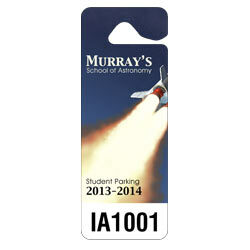 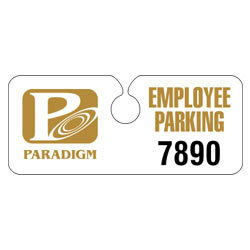 Custom hang tag parking permits are made with a heavy durable plastic that can take a lot of abuse. 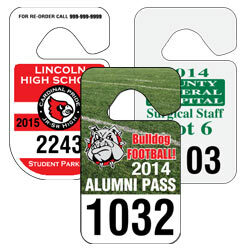 A long lasting custom hang tag permit can be re-used or re-issued when the time comes. 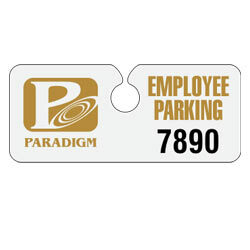 The ease of use and re-usability can save any organization money on permits because fewer permits need to be purchased. 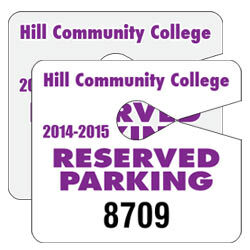 Our hang tag parking permits are great for anywhere that requires renewed parking validation. 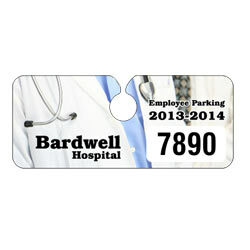 These tags hang from mirrors to avoid sticking to windows and are easy to move from car to car. 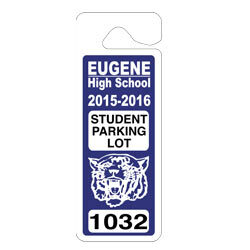 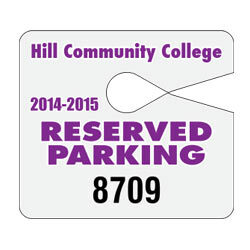 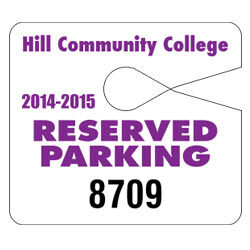 Available in many styles and 5 materials, these custom hang tag parking permits are made to order. 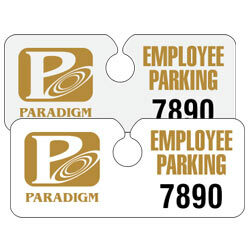 Durable, yet flexible tags can be removed and used on different vehicles - perfect for temporary parking control. 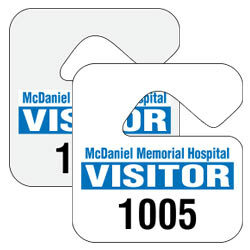 Screen-printed on your choice of .015" White Polyethylene, .035" White Polyethylene, or the following laminated materials: Chrome Polyester, White Reflective, or Glitter Prismatic Material. 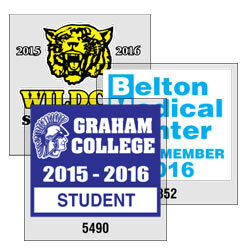 Laminated materials are applied to durable polyethylene and die-cut for a dazzling, forgery-resistant product. 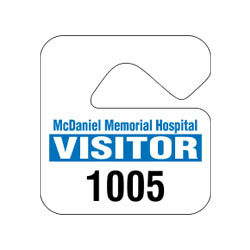 Reflective, Chrome, and Prismatic materials will inhibit scanning or copying and serve as a deterrent to counterfeiting of hang tags. 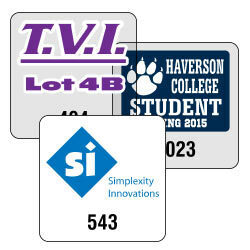 Rounded - 2 3/4" x 4 3/4"
Mini - 2 3/4" x 2 7/8"
Hidden - 4 3/4" x 2"
Jumbo - 4" x 3 1/2"